(This is income tax return for the financial year 2017-18. Applicable for income earned from April 1st, 2017 to March 31st, 2018). Not sure whether you should file an income tax return? Read our article. You can use ClearTax to e-File your IT Return right away. 15th March 2018 i. The fourth installment of Advance Tax due for the FY 2017-18 ii. The due date for the whole amount of Advance Tax for FY 2017-18 for taxpayers covered under the presumptive scheme of Section 44AD and 44ADA Read about how to calculate and pay Advance Tax. 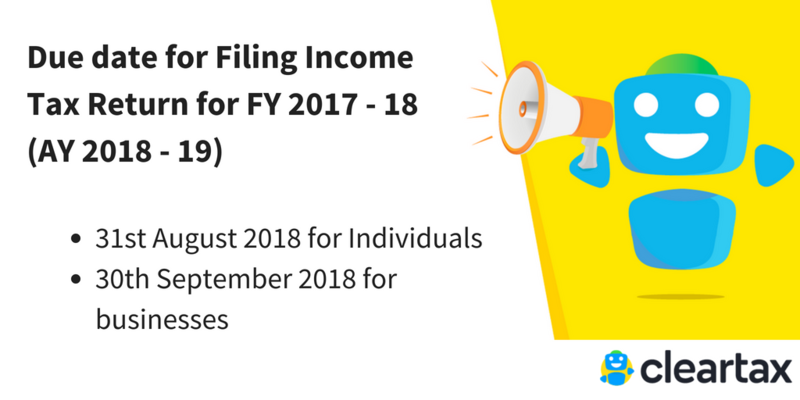 Further, here, it would be relevant to mention that if the due date for filing the original return of income is missed, on can file a return belatedly called a belated return for the FY 2017-18 on or before 31 March 2019.